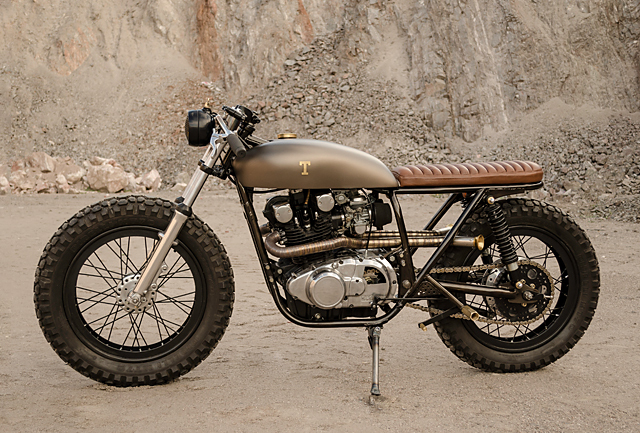 There’s not many things in the custom bike scene that instantly prove a builder has big cojones. So it’s hard to argue with someone who picks to build up a renown ugly duckling, combines five different styles in the design and then rolls out a gorgeous all-purpose machine with no front brake to speak of. Welcome to the world of Vida Bandida Motocicletas from the picturesque city of Córdoba, Argentina, in the foothills of the Sierras Chicas and on the banks of the majestic Suquía River. This is where they tossed aside the idea of a Honda CB, detoured around the fabled Kawasaki Z’s and picked the late to the party 4 stroke of the decade, a 1978 Suzuki GS400 from which they’d fashion something truly special. If Suzuki was playing catch up to the Honda CB’s and Kawasaki Z’s the one area they undoubtedly failed to match their rivals was in the looks department. 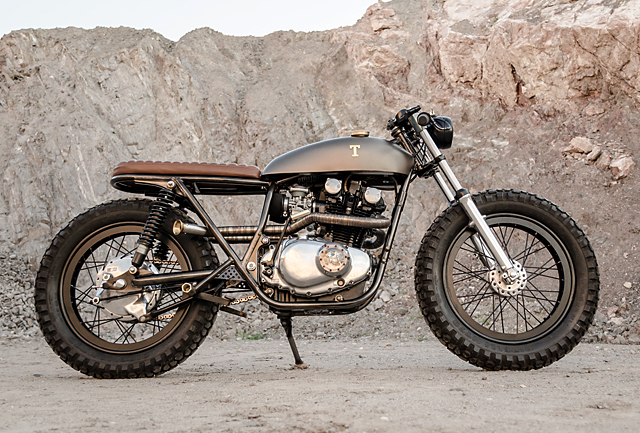 On classic bikes the tank can make or break any build and the GS item is not a thing of beauty, but rather than swap it out Vida Bandida chose to use it as an opportunity to display their fabricating skills. The first step taken was to lower the tank on the frame to improve the lines of the entire machine; the front is then notched to meet the neck while the bottom of the tank is trimmed to run parallel to the ground. The top is further flattened to give an even lower look and the sides are pumped out for a more aggressive profile and to restore some of the lost volume. 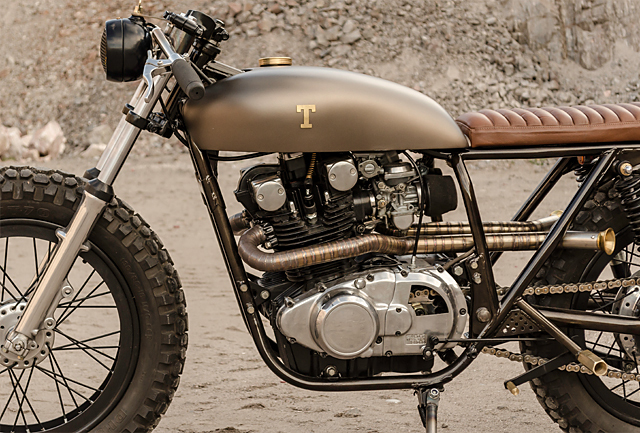 The new tank sports some of the many brass elements added to the build and the T logos can be explained by the name of the bike, “Tocho” which means Billet. 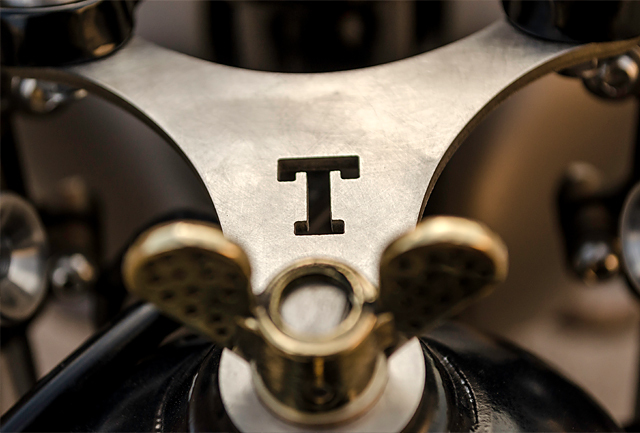 The brass T logos on the tank are complimented by a stunning brass gas cap with another T cut into the headlight support that is held down by a drilled brass wing nut. 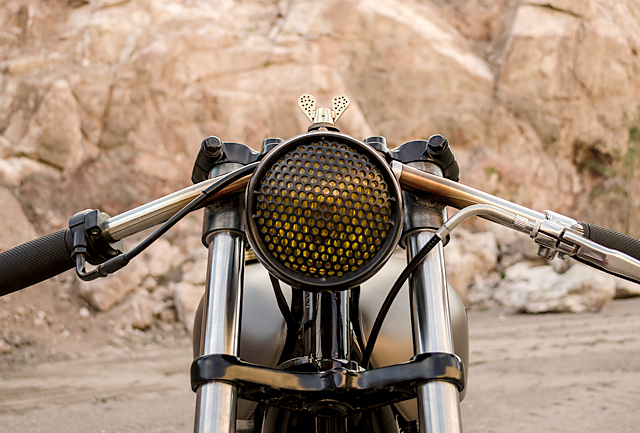 The headlight itself is a small, heavily grilled, yellow-lensed item while custom clip-ons with minimal controls and brass foot pegs keep the clean looks of the build. 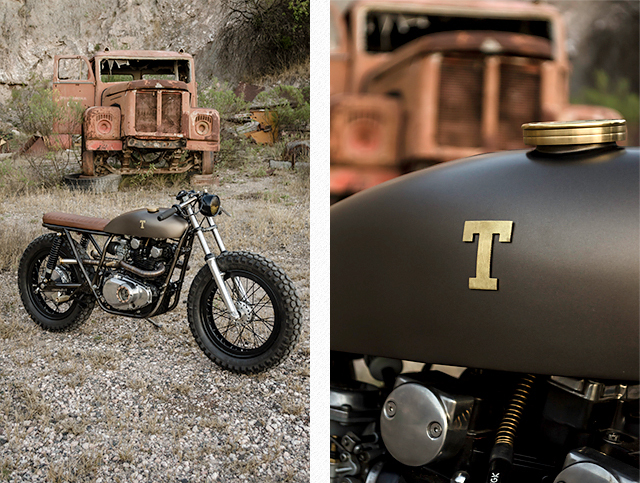 The tank has been sprayed in a matte brown that was laid over a black base coat to give a truly vintage look. To match the classic metal finishes the seat, which makes a perfect junction with the tank, is stitched in slightly weathered look classic brown leather. 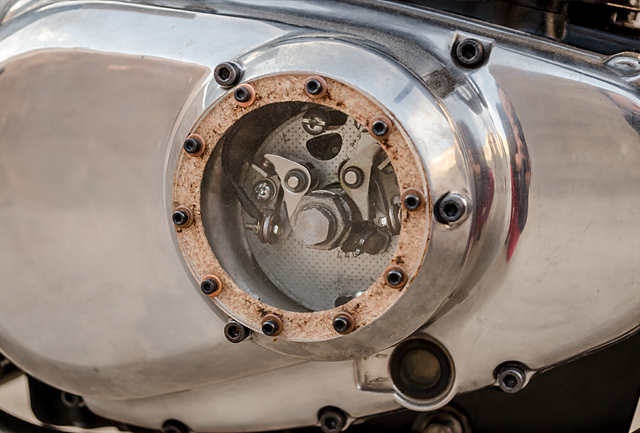 One of the advantages of the GS400 over its contemporary commuter bikes was the engine development that it shared with the flagship 750 model. Having been late to the twin cam 4 stroke market compared to their Japanese rivals, Suzuki learnt from the mistakes of others and technology like the gear driven counter-balancer, cam design and near square bore make it a smooth little 398cc motor that loves to rev. The popular CV style carburettors have been rebuilt and jetted to suit the rest of the engine build and breathe through a pair of foam pod filters. But the pièce de résistance of the mechanicals is the beautiful lobster cut full length exhaust system, both pipes are internally baffled to avoid the need for mufflers. The pipe work snakes its way through the frame to avoid pipe burn and the tips are finished off with two brass outlets that look like the mouth pieces from giant Tubas. If Suzuki got the engine right they made an absolute mess of the wheels on the GS, a weird cross between a five-pointed star and what could possibly be the symbol of a strange 70’s cult. 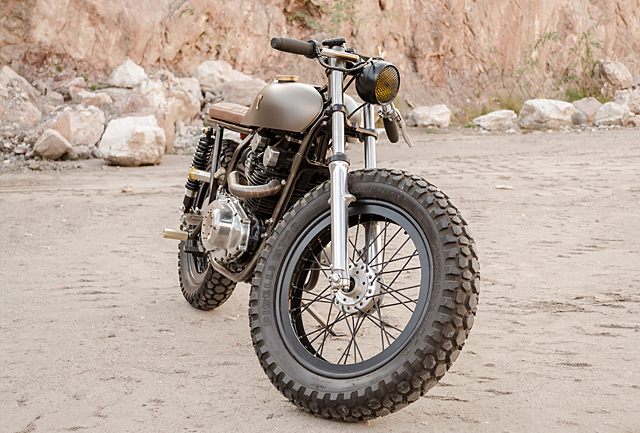 Antonio had a better idea, his boardtracker/café/rat/bobber/tracker would wear traditional spoked wheels and in the Vida Bandida tradition of doing things differently they wear matching rubber front and rear, heavily treaded 130/80/18’s. Then comes the part that proves Antonio has the minerals, the rear brake remains the barely adequate 160mm standard drum while the lack of brake lever is yes, perfectly normal, because this here bike has no front brake at all. It certainly keeps the front end tidy, it’s in keeping with the boardtracker elements of the build and the bike definitely gets ridden hard… Ladies and Gentleman don’t try this at home! Then there are the clever touches that you notice the more you study this machine, the cut out that exposes the sprocket cover, the front on view of the clip-ons that gives a single bar look, the fact nothing from the motor extends out past the frame allowing the mechanicals to be viewed as a solid unit and the clever clear cover that lets you witness the points in action. Because what’s the point of having a big set if you don’t have the brains to design a machine you can ride like a mad man in style. 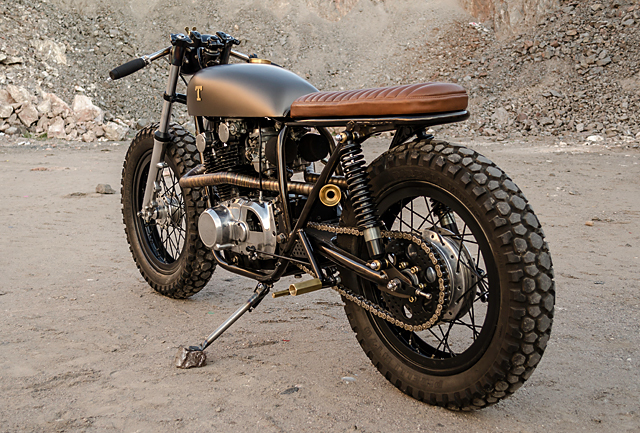 It’s loco, it’s muy peligroso but ultimately Vida Bandida’s little Suzuki is perfecto!